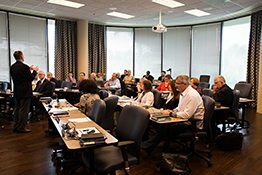 We envision a future in which ABHE members and affiliates will comprise a spiritually robust, culturally relevant and professionally respected 21st century North American biblical higher education movement whose contributions to global gospel impact are multiplying in scale, scope and significance. As God stirs your heart for what He is doing across the biblical higher education movement of North America, we warmly invite you to consider ABHE as part of your stewardship vision. Invest in the next generation of spiritual leaders through the initiatives and training events offered by ABHE. Without investor partners, we cannot do this. But together, we are more than able to serve a new generation of students with spiritual vibrancy and academic excellence. Every donation will be carefully invested in the forward momentum of the Association, to strengthen institutional leaders and expand their capacity for global gospel impact. What compares to the challenge and opportunity of serving as a leader in biblical higher education? Incredible Kingdom impact. The joy of preparing students for a lifetime of gospel-oriented service. Its a biblical, experiential, transformational and missional education that calls for our best. In that spirit, ABHE is committed to providing officers across ABHE with high-value opportunities to sharpen their competency and expand their capacity for distinguished service. To make these transformational experiences available to everyone at an affordable price, contributions are warmly invited from across our Association constituency. Every year, as part of the Annual Meeting, our Leadership Development Offering is received that specifically funds scholarships for leadership development events. Thank you for investing in other leaders to be at their best. For those whose hearts have been moved by the value of the biblical higher education movement, we invite your consideration of including ABHE in your estate or deferred giving plans. By designating a specific amount, percentage or other means of contribution, donors may take advantage of significant tax savings, ensure the fulfillment of their stewardship vision and help ensure the future vitality of the biblical higher education movement. The new ABHE Legacy Fellowship is comprised of those who have included ABHE in their deferred giving plans and have indicated the same through a signed Declaration of Intent. Charter Membership will be open to all who remember ABHE in their deferred giving plans before the rise of the 2016 Annual Meeting. For more information and followup, contact Sherrill Babb, Legacy Fellowship Director.